This production is set for 32 performances only (then goes to Brooklyn), and is in the more intimate Minerva Theatre at Chichester … the main Festival Theatre auditorium is closed for rebuilding. I much prefer the Minerva with its thrust stage, steeply raked seating and small capacity. It has the flexibility of the RSC, but no one has to sit below stage craning their necks up. Add ample loos, public spaces, formal restaurant, informal restaurant, bar. The whole physical experience beats every London theatre except the National. This was a classic King Lear. No alternative timeline was imposed, no concept was imposed, no extraneous costume idea was imposed. It was dressed in generic Shakespearean: rough trousers as britches, big boots, rough cloth tunics, odd bits of armour or chain mail. More Wars of the Roses than Elizabethan, but the mythical Lear was pre-Roman so there’s no era to match. The colour palette was limited, black, beige or brown. Long gowns for the girls, dusty red, dusty blue, grey. White or red with a red cloak for the king. As well as no concept, we had a simple set, few props, just a throne and a stretcher. But it was an elegant set, with abstract brown pillars with gold flecks, that could serve as trees or palace. The floor was a mosaic of stone, bricks, wood. Very 1940s / 1950s modern in fact. The direction was fast and fluent,making full use of the ‘four points of the compass’ entry points to a thrust stage. On the downside, we felt the other roles were necessarily reduced., though the Goneril-Cornwall relationship was brilliant “sins of the fathers” stuff. Edmund is a part actors like to get their teeth into. This was a wolfishly handsome Edmund, doing no more than what’s written, and doing it perfectly. 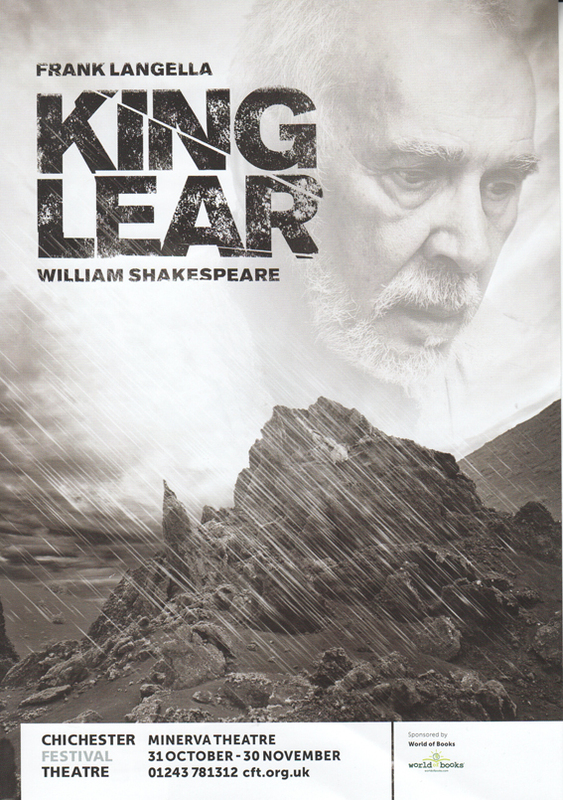 I’m comparing it with the mega-concept “London gangster King Lear” at Bath in the summer, where Edmund’s part was pulled right to the front … but I thought that production more Gloucester & Sons than Lear & Daughters. Albany was intriguingly nasty. Cornwall has the really hard bit … being the pious good guy is much more difficult, but this was a perfect Cornwall. Goneril and Reagan and Cordelia were all played well, and the unusual idea was a young fool, which works as Lear treats him as a replacement child for his three lost daughters, and takes a similar paternal role with Edgar (when Edgar is in Tom the mad philosopher mode). 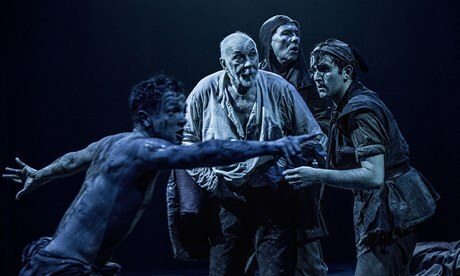 Gloucester and Kent were both excellent, but every part in the play except Lear had less opportunity to make a distinctive mark, because that’s not how it was set up. It was about Lear. Look at the play’s title … I’m recycling my exact remark after I read a review of Kevin Spacey’s dominance in his (definitive) Richard III. i.e. Look at the title of the play. 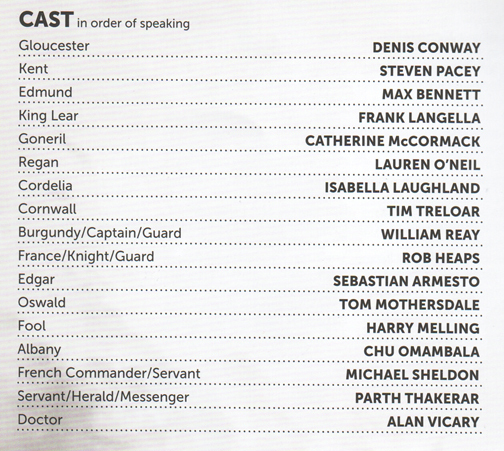 A comment on all three Lears I’ve seen in recent years … Pete Postelthwaite, David Haig and Frank Langella. 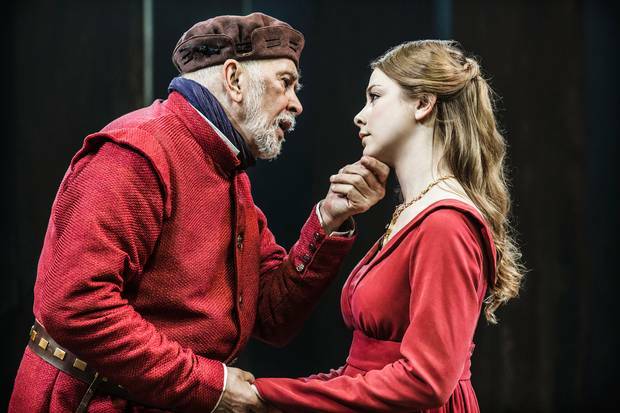 I’m not convinced that Lear should go full angry so soon … Langella does first rate full angry. I see Lear at the beginning as a sentimental, self-pitying Narcissist character, seeking his daughters’ approval, so sure he’ll get it because he can only be the centre of their lives. The instantly furious tyrant is how every director seems to see it, and the majestic authority of Langella is a natural for it. A word for the sound effects. It was spectacularly cinematic surround sound in the storm and in the music. Extremely well-done. The storm effect was heightened by torrential rain on the three actors. There are rain effects and rain effects but having spent the morning walking around Chichester in torrential rain ourselves, we still had wet trouser bottoms and shoes, so this was one we could feel as well as see. I always feel sorry for actors under rain machines, hoping the water is clean and luke-warm at least. I wonder if theatres have the possibility of rain installed permanently or rig it for a production. King Lear demands it, though I have commented in the past on rain use for “wet T-shirt” contest effect. Certainly not here. A semi-standing ovation. I always look … 30%? Certainly huge applause for a stunning performance of a rather old-fashioned type, but it was a refreshing change to see a Shakespeare tragedy stripped to its essentials with a majestic, towering central role.